It’s a New Crochet Hat Pattern! Free? Maybe……..
UPDATE: The pattern is FREE and available on the blog. Click HERE to get the pattern. I started on this hat pattern about a month ago but never did get around to finishing it. I thought it was a pretty pattern but it didn’t seem to jump out at me like I had hoped. Well, I picked it back up a few nights ago using the Red Heart Soft turquoise……that was my problem! It was my color choice! I shouldn’t have done the original pattern in CREAM! 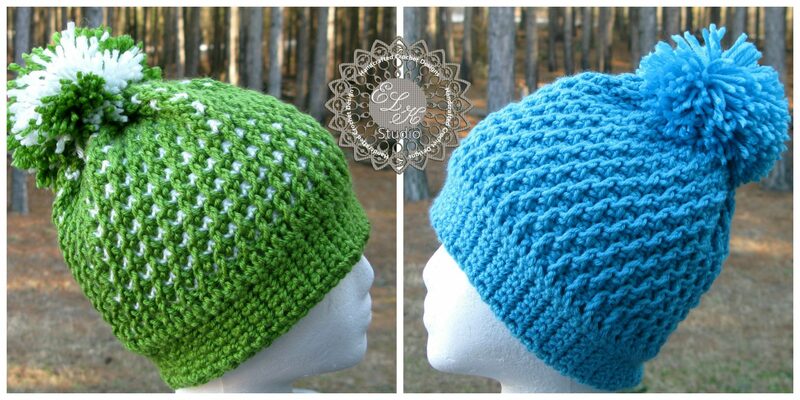 Here’s the hat in a mix of green/white and then done in a solid turquoise. What do you think? I’m working it up again now in a different color and still tweaking the pattern a little, but it’s almost finished. I’m wondering if I should make this pattern free? So, here’s the deal. If you can convince me that it should be, I’ll do it. Leave your comments, begs and pleas telling me why I should make it free. I want some creativity too folks. Your crocheters, so I know you can think of something! Let’s have some fun!